Scones are one of those delectable brunch items that are super fancy sounding and people think they are so hard to make. Let’s get this straight… they are so easy to make. I’ll be the first one to admit that over the past few years I’ve been intimidated to make scones. The first time I ever tried making scones was from a box mix. On the back of the mix there was a recipe for ramping up the recipe from muffins and making them into scones. I was up for the challenge… with a few additional steps I had made scones. It wasn’t until last year that I tried tackling scones from scratch. Seriously, what was I waiting for? I made these orange-poppy scones for the Queen’s Diamond Jubilee tea party we had at work. We shopped at the only British store in town and purchased a wide-variety of teas, biscuits (which are really cookies), clotted cream, and store-bought scones. Of course I decided to bring some homemade scones to the celebration. Of course not only were my co-workers impressed but they are were so thankful for the homemade variety. Scones are so incredibly easy to make! 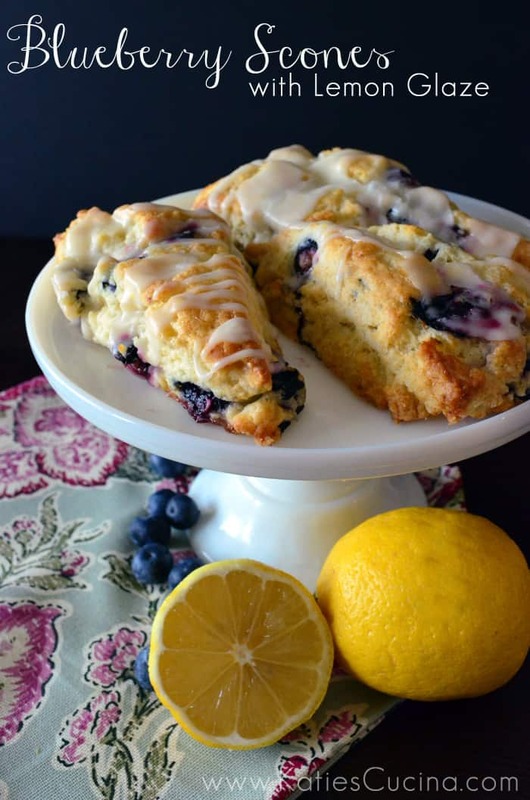 Now, back to these blueberry scones with lemon glaze. The other weekend I didn’t have any eggs on hand for breakfast. I also knew that we would not go out to eat that morning. Breakfast in our house is one that typically is done leisurely on the weekend with eggs, potatoes, a breakfast meat, and on occasion will start with a bowl of chopped fruit or a pastry! Weekend breakfast is truly an experience that we look forward to. So what was I to do with no eggs… well make scones (of course after . Luckily, I had a pint of local blueberries in the refrigerator, so at that point I knew I was destined to make blueberry scones. The lemon glaze was a no brainer since I typically like a sweeter scone and I knew that the powdered sugar from the glaze would sweeten these babies right up. Dense like a typical scone yet moist in the center. Nothing worst to me than eating a rock-hard scone. Make these scones for mom (or someone who is close to you) this mother’s day! In a large bowl sift together the dry ingredients; flour, baking powder, salt, and sugar. Using a pastry blender, cut in the butter and coat the pieces with the flour mixture (the mixture should look like coarse crumbs). Fold the blueberries into the batter (make sure not to mash the blueberries because the coloring will bleed into the dough). Make a well in the center of the blueberry dough mixture and pour in the heavy cream. Fold everything together just to incorporate; do not overwork the dough. On a lightly floured surface lay the dough out into a rectangle about 12 by 3 by 1 1/4 inches. Cut the rectangle in 1/2 then cut the pieces in 1/2 again, giving you 4 (3-inch) squares. Cut the squares in 1/2 on a diagonal to give you the classic triangle shape. Place the scones on an ungreased cookie sheet and brush the tops with a little heavy cream. Bake for 20 minutes until golden brown. Let the scones cool a bit before you apply the glaze. In a microwave safe bowl melt the butter and lemon zest for 30 seconds. Mix the lemon juice with the confectioners' sugar until dissolved and whisk in the butter and lemon zest. Whisk the glaze to smooth out any lumps, then drizzle the lemon glaze over the top of the scones. Let the scones set a minute before serving. These sound terrific! Love those big blueberries!! Thanks Ali! Florida blueberries are thriving right now! So beautiful! I have a love/hate relationship with scones. They are either awesome or you could tile the roof with them. I’m totally trying your recipe. Oh Jane, definitely give this recipe a try. These were still moist yet dense… if that makes sense? Oh my I could eat a plate full of those! 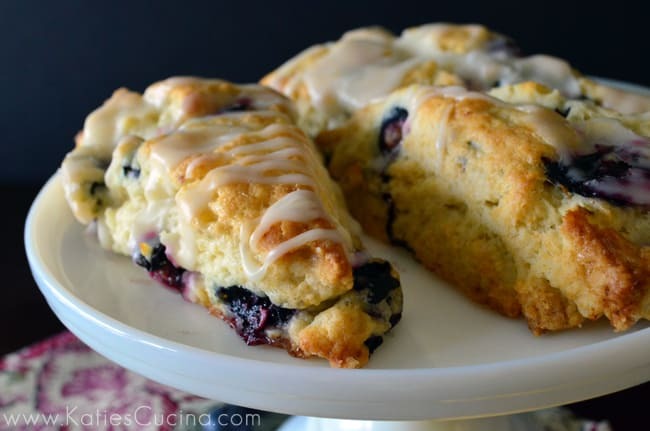 I always thought I wasn’t a fan of scones, but with all these blueberries and that glorious glaze, I know I’d love these. I think you’re right that scones must be pretty easy to make, despite all appearances, because– though I’ve never made them myself– my fiancee makes them every once in a while, and I’m always amazed by how quickly she throws them together! It’s not like with bread where you have to wait hours for something to rise… they’re so fast! Delicious flavors all incorporated in these tasty triangles! I am not sure if I have seen a blueberry scone to look better than those. Absolutely gorgeous!! Years ago there was this little hole in the wall cafe near my house and I went there every week for their blueberry and lemon scones. I really need to give your recipe a try. Laura I hope these live up to your expectations! As I said on Twitter, I love all the themed parties your work throws. I know what I’m making the next time we go blueberry picking! Katie, these look absolutely beautiful. Blueberry and Lemon is always a great combination. I love that you are tackling baking from scratch and doing it like a pro! These photos just made me hungry again. Love it, Katie! These look delightful 🙂 I love the combination of blueberry and lemon! I was searching for a blueberry scone recipe to bake today and this looks like exactly what I was looking for! My only question is, can I substitute 1% milk for the heavy cream? I am ready to bake now, and would rather not have to make a trip to the store if I can avoid it! Thanks for sharing this recipe! Hi Jen–I’m glad you like this recipe. 1% milk is much thinner than heavy cream. I would say that I don’t think it would work; however, I’ve never tried so I can’t guarantee. If you for some reason tried the recipe with the 1% milk I’d love to hear your feedback! Happy Baking! Hi Jen! I’m glad you enjoyed the recipe and great tip on making your own heavy cream! I just made these and only had 2% milk and they still turned out great!! Thanks Mandi for letting us know!!! Searched for a new recipe to try on a snowy Saturday to bake. Had extra lemons and blueberries in the freezer I wanted to use. Used your recipe and it ROCKED!!! Loved it, the only thing I changed was the glaze to be a bit thicker. They were delicious while having a cup of tea and my knitting and watching it snow and catching up on Downton Abbey. Thank you for my new favorite scone recipe. Glad you enjoyed the recipe Liza! 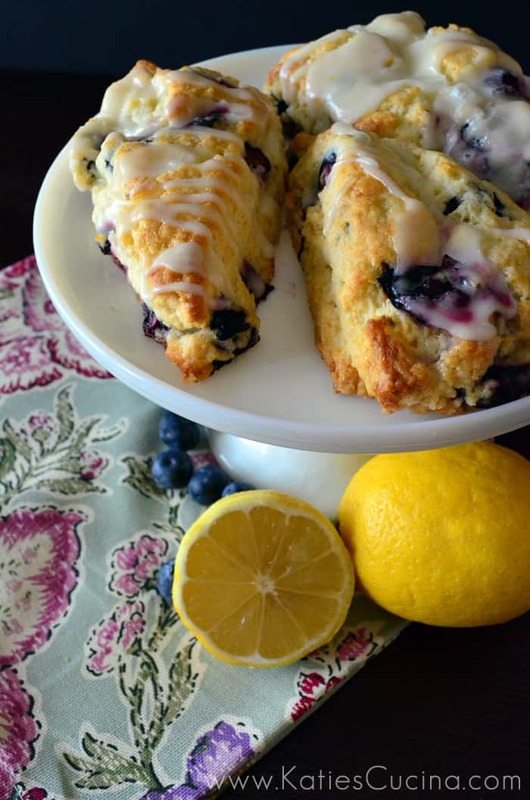 I was looking for a great (not just good) blueberry scone recipe and came across yours. Made them this morning for some guests that had stayed overnight and they were a big hit. One person is gluten intolerant so I had to use my gf baking mix but they turned out fantastic. I also didn’t have heavy cream so used half and half. The texture was good, the taste was so yummy but the lemon glaze put them over the top!! This will be a staple in our house – thanks so much for sharing this recipe. Thank you so much for taking the time to leave a comment! 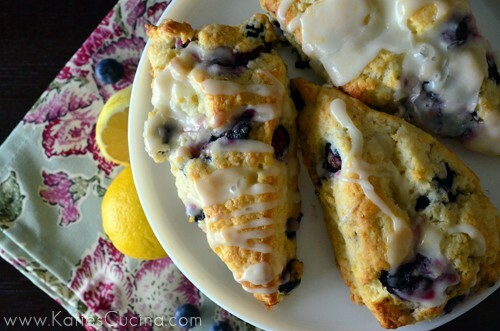 Yes the lemon glaze is what makes these scones shine! What gf baking mix did you use? I have a cousin who is gf and I would love to make these for her. Same amount as I suggested for the flour?